London: A report exposing the role of British government led by the then Prime Minister of England, Margret Thatcher, in June 1984 attack by Indian forces on Darbar Sahib and other Sikh Gurdwaras was released by a diaspora Sikh group on Wednessday (Nov 1). 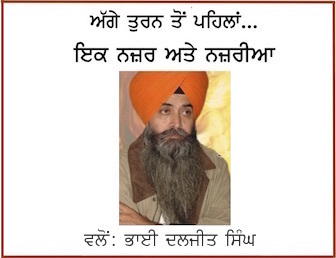 Prepared by freelance journalist Phil Miller, the report is released by Sikh Federation UK. 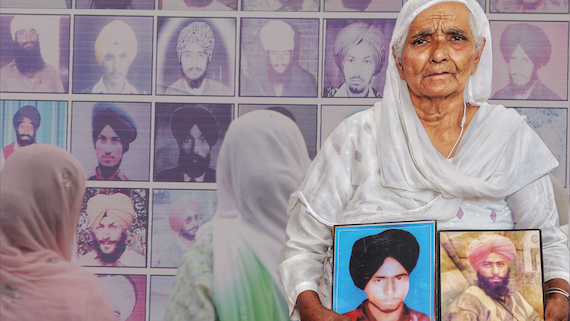 It calls for an independent public inquiry into the episode, including the 1984 Amritsar massacre in which thousands of Sikh pilgrims were killed. In January 2014, top secret UK government files were accidentally released to the National Archives. They revealed that a British special forces officer visited Amritsar in 1984 to advise the Indian army ahead of an attack on the Sikh faith’s holiest site, in which thousands of pilgrims were massacred. Then Prime Minister David Cameron refused calls for a public inquiry, instead hastily commissioning an in-house review which claimed that the British advice was an isolated incident that had limited impact on the subsequent attack. The Sikh Federation (UK) first raised serious concerns on limitations of the in-house review by leading civil servant Sir Jeremy Heywood before it was published and presented to Parliament in February 2014. There were inherent limitations with the in-house review as it was rushed and deliberately too narrowly focused. Whilst the UK government claims there is no need to investigate Britain’s role in India’s repression of Sikhs, this report sets out extensive evidence that raises serious concerns about the veracity of the UK’s official narrative. This report is not an attempt to ‘re-write history’, an accusation which has been directed by the British government at truth campaigns in Northern Ireland doing similar archival research. Rather, it is the Conservative government itself, through its ongoing censorship, who seems to be distorting and manipulating history to suit its own ends. This report is a modest attempt at truth recovery and better understanding the legacy of a bitter conflict. It is the first look at the government’s private account from this period of UK-Indian relations, in so far as the public are allowed access to the records. The conclusions it reaches inevitably diverge from the official narrative, precisely because it takes into account facts that the government wanted to remain hidden at the time, and still do to this day. Although some Sikhs probably changed their view on Britain in January 2014 when Britain’s role emerged, the community’s response has been entirely peaceful. 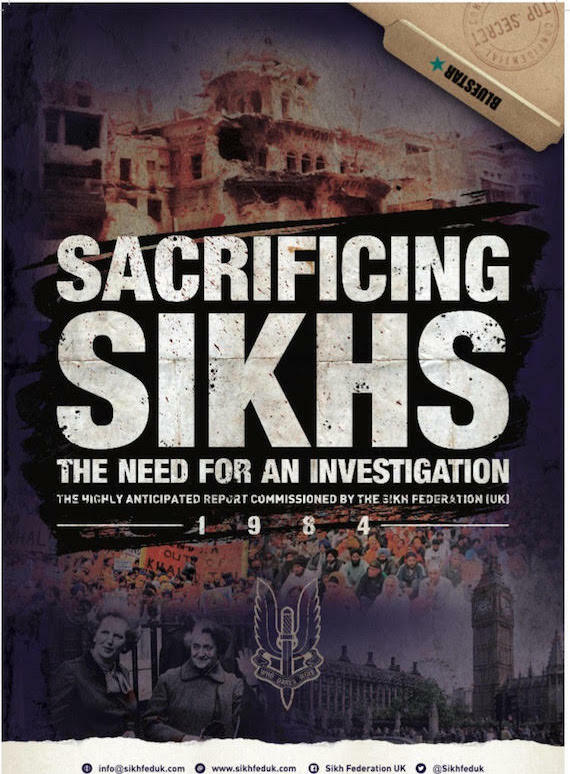 Despite numerous hurdles, the response from the Sikh community led by the Sikh Federation (UK) has been level-headed and sought to establish the truth of the full extent of the UK role in the 1980s in assisting India at home and abroad. The campaign over the last three and half years has had both a legal and political focus with the objective to create sufficient public pressure on the UK government. Despite much information being withheld, this report proves the in-house review was at best inadequate and at worst a cover up. The period intentionally selected for the Heywood review of December 1983 to June 1984 allowed it to overlook a considerable amount of context which clearly demonstrates the paramount importance of arms sales to Anglo-Indian relations in the build up to Operation Blue Star. In February 2014, Heywood downplayed the situation and concluded that the “military advice was a one-off”, a position repeated by Number 10. This has now been shown to be untrue as the in-house review was not as rigorous or thorough as claimed, and Parliament and the wider public have been misled. The in-house review also stated no other form of UK military assistance, such as equipment or training, was given to the Indian authorities in relation to Operation Blue Star. This was repeated several times by the Foreign Secretary in Parliament. This has also been proved not to be true. This report raises serious doubts about the adequacy and integrity of the Heywood report and shows Parliament was disturbingly misled in February 2014 as to the motivations and full extent of UK involvement. It is now all the more important for the current Prime Minister and Home Secretary to announce an independent public inquiry to get to the truth, however painful and damaging, of what happened in the 1980s. The inquiry will send a positive signal to the law abiding British Sikh community, the wider public and Parliamentarians so all can learn from it and ensure it never happens again.